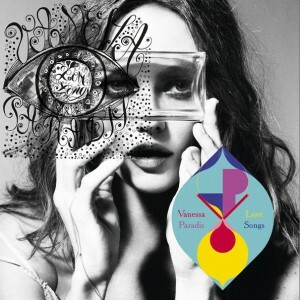 Vanessa Paradis sortira au printemps son sixième album, Love songs, promu par le premier single “Love song” sorti ce lundi et déjà classé dans le top 10 des ventes sur iTunes. French singer and model Vanessa Paradis first hit the charts in 1987 at the tender age of 14. Her single “Joe le Taxi” spent 11 weeks at the top of the French charts, and proved an international success as well. She recorded two albums in Paris before traveling to New York in 1992 to record her self-titled English-language debut, with one-time boyfriend Lenny Kravitz as producer. The album’s “Be My Baby” was also a hit, but Paradis’ popularity waned a bit. Among the various film, television, and modeling engagements she was involved with (Chanel’s Coco ad campaign for one), Paradis found time to release Live in 1994. More film and modelling work followed throughout the next several years, largely replacing her music career for a time. In early 2000 she returned to the music scene with the French-released Bliss, followed by another live album, Au Zénith, in 2001. After that, it was back to yet more film and modelling work (and quality time with the two-child family she built with actor Johnny Depp). Paradis returned to music once again in 2007 with the release of her fifth full-length album, Divinidylle.